These are one of the most delicious sweet treats I have eaten in a long time. They are so fresh and really beautiful to eat as you can taste the elderflower sent strongly as you eat them. Its also a great way to be eating something that is just in season as these days we are all guilty of eating anything at anytime of year from supermarkets. 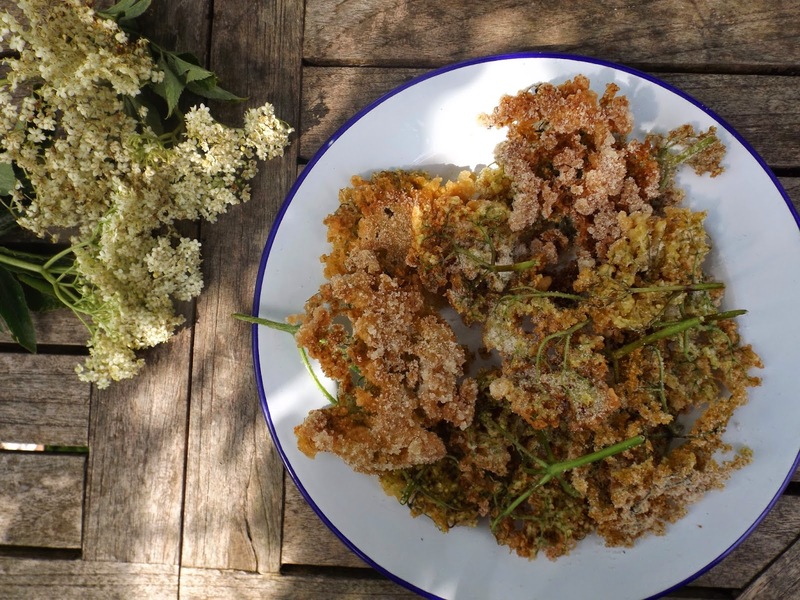 You can only make these fritters while the elderflowers are just starting to blooming but if you catch them at the right time, when the flower heads are just opening you can fry up a big plate of these to share with friends and family after a big sunday roast. They are a pretty decadent treat, as they are battered and fried but served with warm honey they are delicious. To start you will need to pick, prepare and wash your flower heads. You will need about 20 for the amount of batter. Start by washing them thoroughly but delicately as you want the flowers to remain intact but you also need them to be clean, then trip the stalks to about 3 inches (the stalks are not edible so simply eat the battered flowers from the stalks and discard) keeping the stalk allows you to place them into the oil easily and occasionally push them down to ensure all the flowers are covered. Next mix up your batter, you will need..
Sift your flour olive oil and sparkling water into a bowl and beat until turned to a batter. Then leave to sit for about 30 minutes. Just before you are about to fry your elderflowers beat in your egg white. Next heat about an inch of rapeseed oil in a pan, test with a small piece of bread to check if it ready. When the bead sizzles and turns golden you know it is ready for your flowers. Dip your flowers one at a time, let some of the batter run off and then place into the oil where it should sizzle nicely. fill the pan with your flower heads - be careful not to cramp them as they want to keep their shape. Once golden lift out and leave to drain on some kitchen towel for a few seconds and then dip in caster sugar. Repeat this process until all your flower heads are done. Serve almost immediately while they are all crunchy with some runny honey. A delicious early summer treat.